While there were many issues discussed, and action taken on several different species at last week’s ASMFC meeting, the below are what we felt were issues important to anglers. For the full meeting report, see the Commission’s 2018 Winter Meeting Summary. 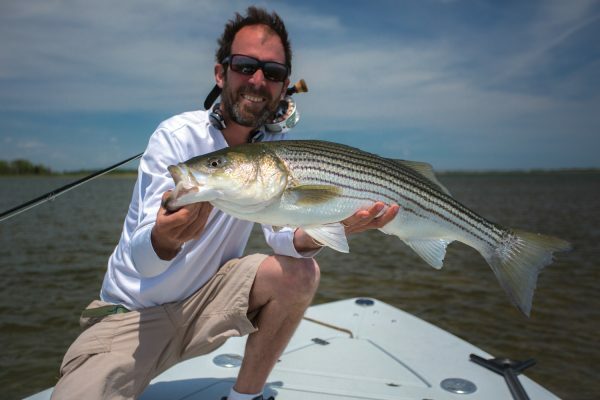 The Striped Bass Board (the board) met on Wednesday to consider a “conservation equivalency” proposal from Maryland. For some quick background, back in 2015, the Commission, in response to declining striped bass numbers, implemented Addendum IV, which mandated a 25% reduction along the coast and 20.5% in the Chesapeake Bay, with the stipulated intent of achieving an overall 25% reduction. (Note: Pay attention to that last part because it’s important). To accomplish such a reduction, the Addendum required coastal states to go from a bag limit of two fish at 28” to one fish, although it also allowed states to achieve such a reduction through “conservationally equivalent” regulations should a state choose. No such fixed limits were set for Chesapeake Bay jurisdictions, which were merely required to establish regulations designed to achieve the 20.5% reduction. Thus, the state of Maryland, which had a prior size limit of 18” in the Bay, bumped their size limit up to 20”. Late in 2016, the Board was presented with an assessment update that evaluated state and coastal performance of Addendum IV management measures in 2015. While every coastal state achieved a harvest reduction that was either close to or much greater than the required 25%, Maryland didn’t come close to achieving its required 20.5% reduction. In fact, its recreational landings increased dramatically, and were 50% higher than they were in 2012, rather than being 20.5% less.